The swan is familiar to us all from Hans Christian Anderson’s story. In the tale the poor duckling, mocked and ridiculed for being so ugly, magically transforms into an elegant and graceful adult swan–thereby becoming a symbol of transformation. 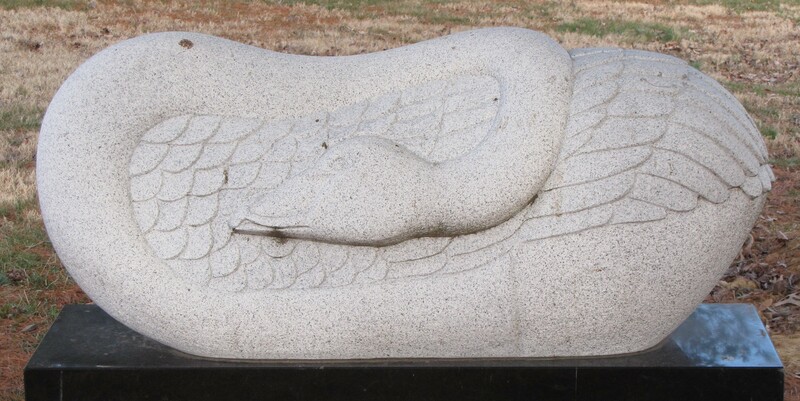 The swan in funerary art could possibly represent the metamorphosis from one form into the next. Because the swan often pair for life, the swan is also a symbol of love. HE PUSHED THEM…AND THEY FLEW. Are there many swans like this one on gravestones? This is the only swan I have seen. Also, I can’t find anything in the literature about swan symbolism in funerary art. This sculpture seems to be unique. If I find another one, though, I will most certainly write about it. Wow. That is an amazing epitaph! The curled swan with its head nested into its feathers coupled with the epitaph creates an image of the relunctant swan taking flight after it is pushed. An amazing combination of the visual supporting the word on this monument.